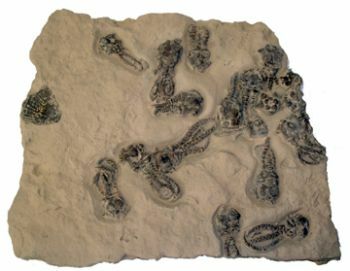 This is a superb crinoid mortality plate replica with 17 specimens of Jimbacrinus Bostocki from the Cundlego formation Gaskoyne Junction Western Australia. Dating to the Late Artinskian of the Permian period-circa 284-275 Million Years Ago. Few collectors can afford a real specimens like this because they sell for hundreds of dollars.